In my last article, I discussed lunar image stacking in detail. Since then, I’ve received a few questions on deep sky stacking and what images should look like at the 3 major stages of processing: raw, stacked, and final product. So I’m going to briefly show what the results of stacking are in this article. 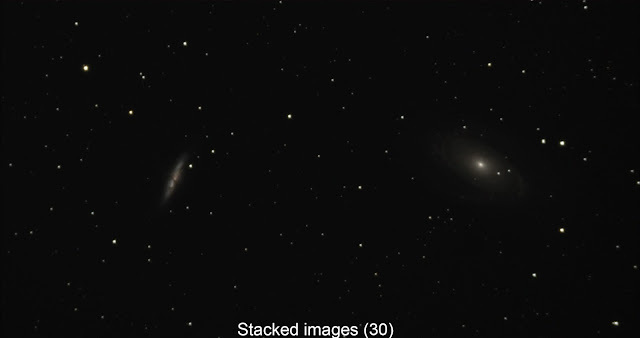 Stacking of deep sky images has several benefits for the modern astrophotographer. The most obvious is to be able to combine many exposures to give the same effect of long exposures of the days of film. In this digital age, stacking is an essential part of deep sky imagine. Long gone are the days and associated challenges of shooting single 30+ minute exposures of deep sky objects on film. The biggest and most easily understood benefit is that you can take a bunch of shorter exposures, stack them, and get the combined result of a long exposure that equals the lengths of the shorter exposures combined. At least this is the way it works in theory. There are limitations, but by and large, 15 x 2 minute exposures will give you a result comparable to a single 30 minute exposure, either digitally, or on film. Digital noise is a reality of long exposure digital photography. As digital camera technology advances, sensors are getting better and produce lower noise. But noise is still an inevitable part of photography, particularly long exposure night photography. Stacking multiple exposures increases the signal to noise ratio of the image. This means that details that are present in every single frame (stars and deep sky objects) will be amplified, whereas random background noise will be removed. Even things like meteors, satellites, or planes flying through your field of view (which would have ruined a long exposure on film) will be automatically removed via the stacking process. If detail isn’t in every single frame in your stack, it won’t be visible. Adding calibration frames (dark, bias and flat frames) will further increase the quality of your image. Dark frames will remove the noise signature of your camera’s sensor from your final image. Flat frames will remove any vignetting and dust motes you may have on your sensor. Bias frames will eliminate traces of hot and cold pixels on your sensor. The details of calibration frames is beyond the scope of this article, but is very worthwile looking into. At the very least, you should be shooting dark frames whenever you shoot deep sky objects, and at least 50-75% of the number of light (image) frames that you’re shooting for best result. This is probably less obvious, but stacking makes tracking more accurate. It’s far easier for any mount to track over short durations versus long ones. In the days before auto-guiding, astrophotographers had to diligently manually correct for tracking errors on their mounts. The smallest of tracking errors would ruin a long exposure. Most quality motorized mounts, even the more inexpensive varieties, can easily track an object accurately for a minute or two, depending on the focal length of the telescope or lens. However, over longer periods of time, there will be some drift which will cause stars to trail. As a result, stacking many short exposures with pinpoint stars will yield a far better end result than using the equal time of longer exposures. With modern mounts and imaging techniques using more sophisticated setups that include auto-guiders. this isn’t necessarily an issue. With accurate polar alignment, a guide scope and camera, you can literally track for hours with near 100% accuracy. The auto-guiding system will send corrective instructions to your telescope compensating for any drift, giving you sharp, pinpoint images. Now we’ll take a look at how images look at the various stages of the stacking and post-processing processes. 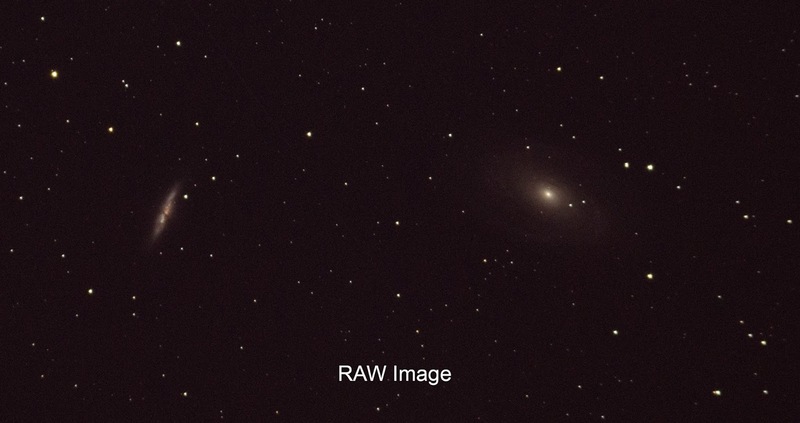 For this example, I’m going to use an image of M81 and M82 that I recently shot. For this image, I shot 1 hour of 30 two minute exposures plus 20 dark frames for noise reduction. Unfortunately, due to user error with this new telescope (second time out with it), I lost a whole hour’s worth of exposure time. I had shot 2 hours’ worth of exposures, but when checking my results after 1 hour, I inadvertently messed up my focus as I had forgotten to lock down the focuser, Lesson learned and mental note made for next time! The images were shot using my Nikon D5100 attached to my new Explore Scientific ED80 apochromatic refractor. Tracking was done using my Celestron Advanced VX mount without guiding. The images were shot at 16 megapixels and had a much wider field of view. 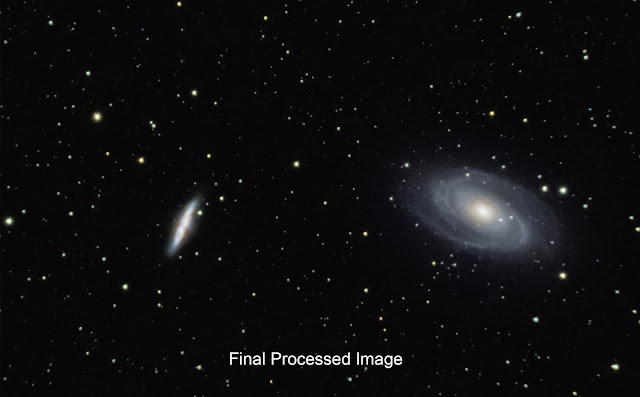 These samples images are heavily cropped to highlight the details in the galaxies and to show the levels of background noise. The full, final image is shown at the end of this article and you can see how much better it looks at its proper resolution. This first image shows what a raw image from the camera looks like. No processing was done on it other than the crop and saving to JPEG. As you can see, detail in the galaxies is visible, but rather faint. And there’s a lot of noise and pixellation washing out the details. Anyone familiar with deep sky objects will immediately recognize the objects in this image, but the results are rather underwhelming. This second image shows the result of 30 stacked exposures + 20 dark frames using DeepSkyStacker. The background noise that plagued the single RAW frame is almost fully eliminated and the background is nice and smooth. The effects of light pollution are amplified over the RAW but the background is nice and uniform and almost completely noise-free. The image is still fairly low contrast, so the finest detail is hidden, but finer structural detail is visible in the galaxies. The gradients aren’t very smooth, but that’s a side-effect of JPEG compression. The TIFF files I’m working with in Photoshop don’t show these artefacts anywhere nearly as bad as this image. But you can most definitely see how this is a huge improvement over a single RAW file. This image is a crop of the final version showing a similar field of view as the last 2 images. At this stage, The image has been stretched to bring out faint details, colour corrected, and had a false luminosity layer applied to brighten the galaxies and make the fine details stand out. Dust lanes jump out and fine details not visible in the last 2 steps are clearly visible. The true colours of the galaxies and stars are properly balanced as well, giving the final image far more life than you could ever get from a single exposure. As you can see, most of the rough gradients are gone. A small amount of background noise is visible due to the stretching required to enhance the galaxies, but it’s really only visible when zoomed in at this level, which is beyond the real resolution that this telescope and camera combination are able to clearly resolve. And finally, we have the final image at full resolution. It was lightly cropped from its 16 MP size to remove stacking artefacts from the edges, but otherwise, it’s the full field of view offered by this scope and camera combination; roughly 2.75° x 1.75°. At this resolution, noise is not a factor and details in the galaxies is smooth. The background is neutral and the star colours pop out. 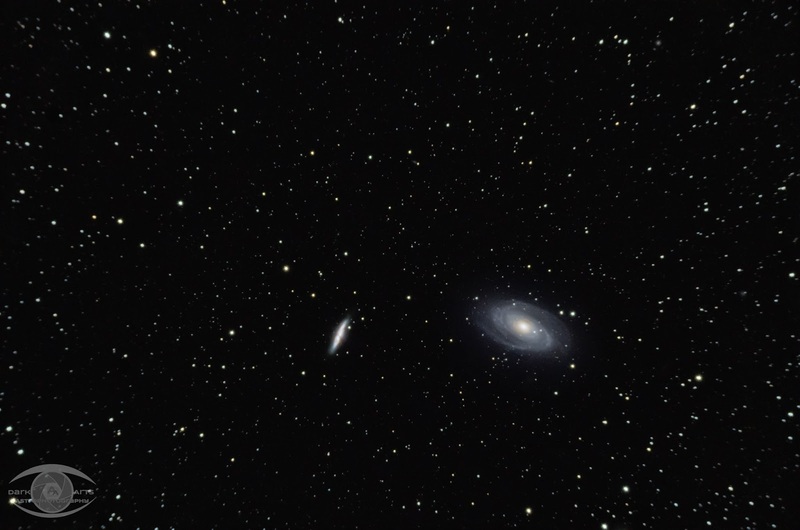 And of course, the galaxies stand out in all their glory with fine detail visible in both. The benefits of stacking are numerous, and it’s standard practice in modern astrophotography. Hopefully this answers questions on the benefits of stacking and how it affects images.